We’ve shut him up. The moment Saddam’s hooded executioner pulled the lever of the trapdoor in Baghdad yesterday morning, Washington’s secrets were safe. The shameless, outrageous, covert military support which the United States – and Britain – gave to Saddam for more than a decade remains the one terrible story which our presidents and prime ministers do not want the world to remember. And now Saddam, who knew the full extent of that Western support – given to him while he was perpetrating some of the worst atrocities since the Second World War – is dead. “But now with nearly 3,000 American soldiers killed and the Iraqi death toll exceeding 600,000 by some estimates, Bush may be forced to savor the image of Hussein dangling at the end of a rope a little more privately. Stop all the clocks. He is dead. Saddam Hussein had a rather good death, and dictators shouldn’t have good deaths. He went to the gallows in dignity, holding the Koran, urging reconciliation, his head uncovered amid his captors’ balaclavas. The grotesque exercise turned a brutal tyrant into something like a martyr, a victim of a victor’s justice. After what Human Rights Watch called a “trial by ambush”, because of the conduct of the defence and the rush to judgment, the execution was overhasty too, as if his captors felt they had to dispatch him before 2006 was out. Was this intended as a kind of new year message from George W Bush? For Auld Lang Syne? The execution of Saddam may have brought “closure” to the White House, but it left a bitter taste in the mouths of the rest of us. He was executed under the auspices of an Anglo-American occupation that has brought little but death and destruction to Iraq. Even members of the Iraq Study Group in the US Senate accept that the people of Iraq are probably worse off now than under Saddam. So, who is going to hold the executioners to account? Where Were the Mass Graves? Relatives of the former Iraqi president say Saddam Hussein has been buried in a family plot in Awja, close to Tikrit. An earlier family statement issued on Saturday night said the executed leader would be buried in Ramadi, but the authorities there said they were unaware of any plan to bury him there. Former Iraqi President Saddam Hussein has been executed by hanging at an unspecified location, reports say. Iraqi TV said the execution took place just before 0600 local time (0300GMT). It was witnessed by a doctor, lawyer and officials. It was also filmed. 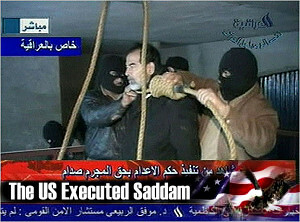 Saddam Hussein was hanged just before 10 p.m. EST. “Bush administration officials” are telling CNN that Saddam Hussein will be hanged this weekend. Convention dictates that we precede any discussion of this execution with the obligatory nod to Saddam’s treachery, bloodthirsty rule and tyranny. But enough of the cowardly chatter. This thing is a sham, of a piece with the whole corrupt, disastrous sham that the war and occupation have been. Bush administration officials are the ones who leak the news about the time of the execution. One key reason we know Saddam’s about to be executed is that he’s about to be transferred from US to Iraqi custody, which tells you a lot. And, of course, the verdict in his trial gets timed to coincide with the US elections. The execution of former Iraqi president Saddam Hussein serves not justice, but the political purposes of the Bush administration and its Iraqi stooges. The manner in which the execution was carried out—hurriedly, secretively, in the dark of night, in a mockery of any semblance of legal process–only underscores the lawless and reactionary character of the entire American enterprise in Iraq. There were conflicting statements throughout Friday about how and under what circumstances the death sentence against Hussein, confirmed by an Iraqi government tribunal December 26, would be carried out. There were continual communications back and forth between the government of Prime Minister Nouri al-Maliki, which nominally controlled the judicial proceedings, and the American military authorities who had physical control of the prisoner and delivered him to the execution site in the US-controlled Green Zone. This was absolutely at the direction of Bush. The timetable of the trial and the major milestones were too coincidental with the US political timetable. And of course getting Saddam out of the way removes the possibility of any awkward questions being asked (and embarrassing answers being given) in trials for his other crimes – such as what involvement western governments had in his regime over the years. How stupid do they think we are?? IT was not the Iraqi Government but its American masters that chose to execute Saddam Hussein in a great rush as soon as the first sentence was confirmed, thus cancelling all the other trials on far graver charges that awaited him. The present Iraqi Government had nothing to hide if those trials went ahead; the US Government did. Cast your mind back to the US invasion of Iraq in March, 2003. Washington’s pretext for war then was Iraq’s alleged weapons of mass destruction, with barely a word about bringing democracy to the downtrodden Iraqi people. But in order to persuade us that Saddam’s WMD were a threat to the whole world, we were told a lot about how wicked he was, how he had even “gassed his own people”. Fair enough, and the trial for the gassing of the Kurds actually got started a couple of months ago. Other trials, for his savage repression of the Kurdish revolt in 1988 and the Shia revolt in 1991, were already scheduled to happen this year. But none of that came to pass. All the other trials have been cancelled, and they actually hanged Saddam for the judicial murder of 144 villagers in the town of Dujail who were allegedly involved in a plot to kill him in 1982. BAGHDAD, Iraq – The person believed to have recorded Saddam Hussein’s raucous execution on a cell phone camera was arrested Wednesday, an adviser to Iraq’s prime minister said. As the Iraqi government mounted an investigation into how officials smuggled in mobile phone cameras, he also challenged the accounts of the justice minister and an adviser to the prime minister who said the film was shot by a guard — Faroon said one of two people taking video was a senior government official. “Two officials were holding mobile phone cameras,” said Faroon, who was a deputy prosecutor in the case for which Saddam was hanged and is the chief prosecutor in a second trial that will continue against his aides for genocide against the Kurds. “One of them I know. He’s a high-ranking government official,” Faroon said, declining to name the man. “The other I also know by sight, though not his name. He is also senior.